Color macaroni and use it in there. Dry sand or wet sand properties. Great Idea, Patti, since 5 year olds put most anything in their mouth at some point. Mix in zip bag, drain off liquid, place on foil-lined baking sheets to dry overnight. Colored pasta for craft projects! Dyeing dry noodles for art collages, stringing awesome necklaces, or sorting by color, shape etc. Use any dry goods….rice, pastas, color macaroni, beans…use cups same as the sand..also, hide letters (plastic type) in dry goods and child has to find- (name, letter of the week or just to introduce them to the alphabet) Good Luck! Dry beans are great! Use pretend fossils and bones for digging up, measuring cups, funnels, plastic cups of different sizes, other items to fill up and then dump out. Also, use soap and water and have a “wash day” for the water table after reading a story about washing clothes, washing the dog, etc. Have toothbrushes and other small scrub brushes available for scrubbing small plastic toys clean. PAPER TOWEL TUBES, MEASURING CUPS, COLANDER, TURKEY BASTER, ketchup and mustard bottles…any bottles for filling and squeezing and funnels for water table. COOKING TONGS, cut a milk jug in half and use the handle/hole end for a scoop and/or a funnel with sand or water. Mini trees and decorations for Christmas time. Soapy water and wash cloths and baby dolls to bathe, soapy water and dishes to wash, potting dirt with artificial flowers and pots with gloves and gardening tools to plant…those were a few of my preschoolers favs. We sometimes put packing peanuts in the winter, with small toys hidden among them. In the spring I put scratch grains, (chicken feed) in there when we are hatching chicks, and add small farm animals. Cotton balls, shredded paper, pine cones, and acorns are good too. Talk about bodies of water (rivers, lakes, ponds) and have kids make them in the sand during center time. You can help the kids add water afterwards. Are you a member of Pinterest? They have some of the greatest sensory table items there. I did the same move 2 years ago and I love it! I use sand, and when we discuss habitats it becomes a desert. I put animals in and students have to build habitats that will keep the animals out of the sun. Sensory table ideas. At the beginning of the year I use colorful pompoms with plastic ice cream bowls & spoons- I found @ the dollar store. 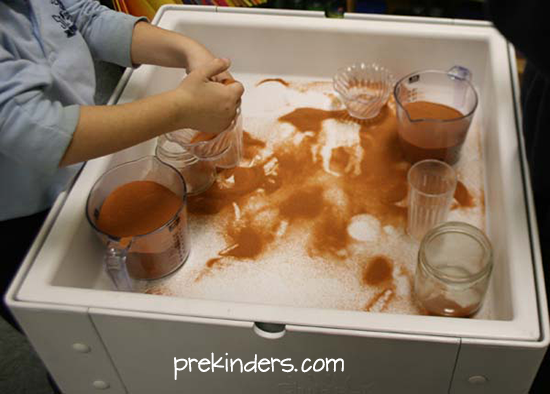 It is a great intro activity for the sensory table and it is not as messy as sand & water. I use sand/water later in the year. I use rice in my sand table ( non bleached). I then put colored counting bears in. The kids can find them and sort them into colored bowls. I also put little items for letter of the week, and label trays with the letters and they sort them by the beginning sound. Pull ideas from the books you read at story time. You can make a frog bog with a few large rocks and a log or two, recycled tire chips from the playground can be for city etc. Do leaves, or hay in fall, snow, ice blocks (make big guys in tupperware or balloons), or instant snow or clean mud in winter, and soil in the spring with fake flowers and pots. Add things from your block center (farm animals, dinos, trucks, etc) as your theme dictates. For multi-sensory add extracts to make the water scented with a little food coloring. For colored days tint the water and add big legos of that color. Have parents collect trial sized bottles with lids for screwing and add sequins or glitter for fine motor. With the holidays coming just chuck in bows of all colors and sizes for them to sort. We do clean trash around earth day- shredded paper and cut up boxes. I also hang a dust pan right next to the table so they can sweep as they go, and brought in an old XL bath mat to go under the water table to catch any drips so they don’t slip. Also, TEACH them how to put wet things into a colander or dish drainer to dry, and how to drain the table and wipe it down with an old towel. Lots of times they ditch clean-up and get into trouble with nothing to do while the teacher is cleaning up the mess. You have to supervise a lot at first but once they get the hang of it- it makes your life easier.